Cloud 9 Adventures is premier provider of specialty concert vacations held internationally on fully chartered cruise ships and at all-inclusive resorts. Led by industry professionals with a vast array of experience, the in-house team offers turnkey services that encompass customer service, sales & travel services, marketing, consulting, and brand management for destination music events. Founded in 2003 and headquartered in Boca Raton, Florida, Cloud 9 Adventures has become a music industry innovator by successfully implementing the planning, promoting, and executing of over 40 top-notch and sold out international events in paradise, working with an array of bands and artists to achieve a fully tailored event. Uniting fans through music while exploring new places and sharing the ultimate live music experience is a paradigm shift in the industry. Cloud 9 events exemplify this shift by providing a full schedule of artist-involved activities and workshops, connecting fans and artists in a unique music experience that transcends beyond the main stage. Featuring artist-centric and fan-focused events that take place in paradise, Cloud 9 Adventures is changing both the live music experience and the way people vacation. Castaway with Southern Ground is an all-inclusive concert vacation hosted by Zac Brown Band at the Hard Rock Hotel Riviera Maya, Mexico. Zac Brown personally curates the additional artists on the lineup, creating an ultimate music event. With artist-led workshops, activities, and multiple appearances by Chef Rusty, this multi-day event is a very intimate setting geared towards Zac Brown Band Zamily and fans. 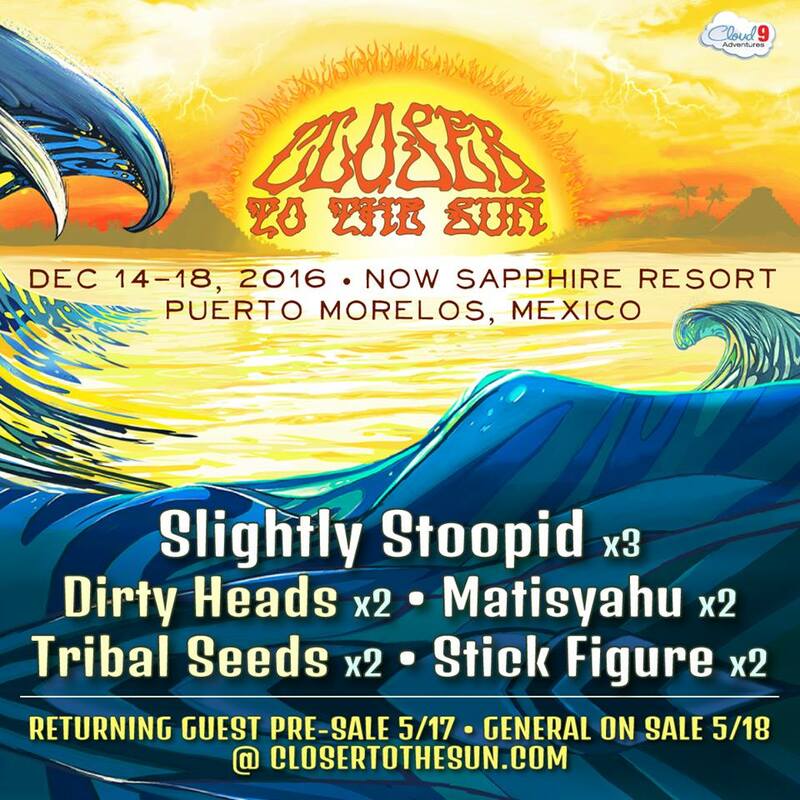 Beginning in 2014, Closer to the Sun is a multi-day destination music vacation which features host band Slightly Stoopid as well as a variety of additional reggae artists and special guests. Held at Now Sapphire in Puerto Moreles, Mexico with the stage located right on the beach, the event includes artist-hosted activities and workshops, an autograph signing, as well as off-resort excursions for fans to participate in. 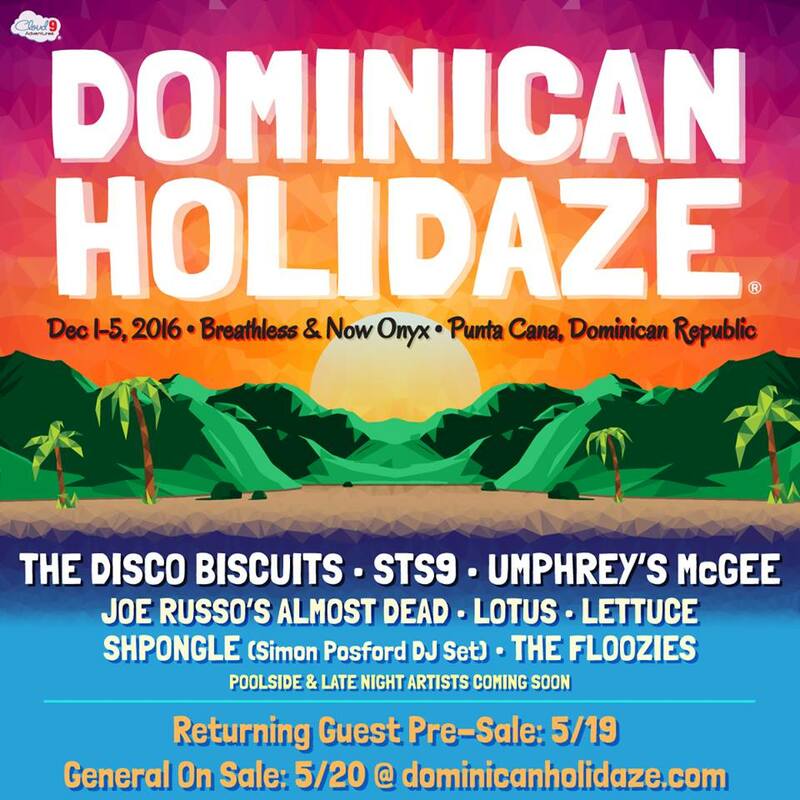 Cloud 9 Adventures’ longest running resort event, Holidaze, returns to the Dominican Republic for another edition of Dominican Holidaze. This event features four nights of music on the beach with host bands Umphrey’s McGee, The Disco Biscuits, and STS9, plus a variety of supporting artists and special guests. After moving Holidaze to the Dominican Republic in 2014, following four years in Mexico and three years in Jamaica, the event has now been held at Breathless Punta Cana Resort & Spa, located on the Caribbean Sea on the Eastern end of the Hispaniola Island. The event features poolside set parties, artist-led activities, a variety of off-site excursions, and an opportunity to interact with artists – all in addition to the beautiful amenities of an all-inclusive resort. Holy Ship! is stepping it up in 2017 with two b2b sailings as well as an extra night added to each adventure! Enjoy the best artists in the scene aboard the beautiful Norwegian Epic. Jam Cruise is one of the first and longest running annual concert vacations held aboard a luxury cruise ship. Expanding across the musical genres of jam, funk, rock, jazz, and electronic with approximately 25 bands and a multitude of special guests, there is music playing nearly around the clock in multiple venues around the ship. In addition to music performances, the event hosts workshops, activities, daily yoga classes, and specialized programs with artists’ involvement throughout the duration of the event. 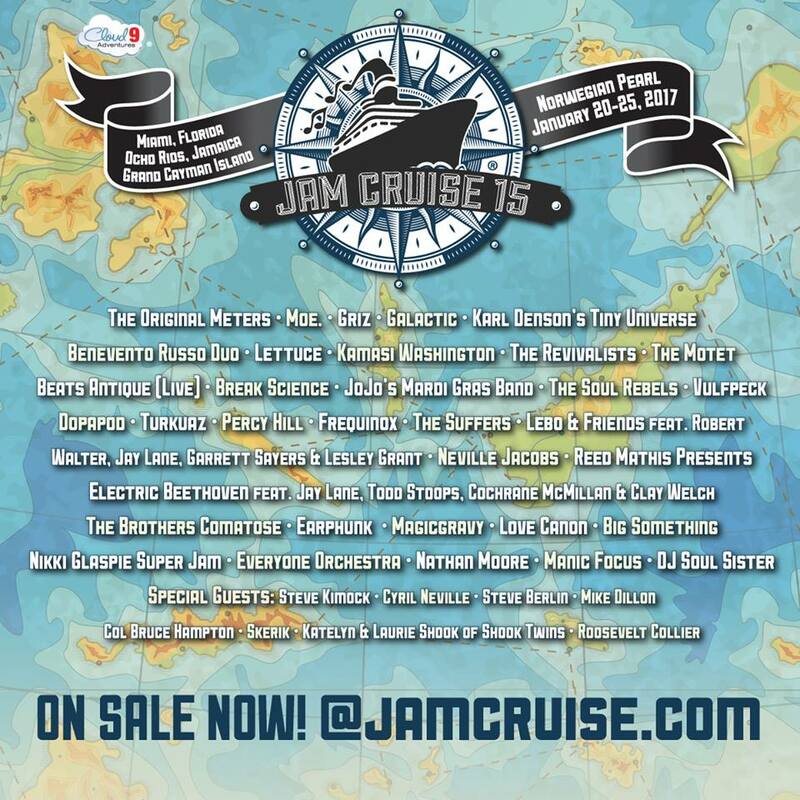 Jam Cruise is well known in the industry for showcasing talent and musicianship in an intimate setting while encouraging collaboration and jam sessions to naturally unfold. The schedule is designed with venues that are geared specifically for collaboration, such as the Jam Room, in which musicians rotate in and out of a live stage session. In addition, Jam Cruise hosts a variety of onboard programs, including: Brews at Sea, an onboard beer program which features a variety of craft beers from around the country; Chefs at Sea, in which featured chefs from around the country curate a specialty late night menu onboard each night; Masters Camp at Sea, a buy-in onboard program offering participants the opportunity to hone their skills as they learn from world-class musicians through an immersive daytime schedule. In addition, passengers can experience cultural excursions in port stops, service projects to give back to local communities with charitable arm Positive Legacy, and artist hosted activities – this is more than a cruise and more than a festival – it is one solid community of artists, music fans and some of live music’s best who gather once a year on this musical adventure. My Morning Jacket returns to Mexico for the third edition of their One Big Holiday concert vaction experience! Join My Morning Jacket, Gary Clark Jr., The Head And The Heart, Kurt Vile & The Violators, Preservation Hall Jazz Band, Deer Tick, Lucius, Carl Broemel, and Merrill Garbus of Tune-Yards at the Mexico's Hard Rock Hotel Riviera Maya, February 4-8, 2017. In addition to four nights of music overlooking the Caribbean Sea, guests will also enjoy daytime activities and games, offsite excursion adventures, all-inclusive accomodations, and more. Full event details coming soon! Hosted by southern-jam rock band Widespread Panic, this ultimate music vacation features a rare four-night run of Widespread Panic performances. Beginning in 2012, the event has also featured a variety of additional bands and special guests, including an artist-curated “Playa Allstars”, which perform late night sets. Previously held in the Dominican Republic, the event moved to Hard Rock Riviera Maya Hotel in Puerto Aventuras, Mexico, in 2016. The event features artist-led activities, special poolside and late night sets, and off-site excursions for fans to experience a very intimate music getaway. Strings & Sol is an annual multi-day bluegrass concert vacation held on the beach in Puerto Morelos, Mexico at Now Sapphire Resort. With the stage right on the beach, the event begin in 2012 and sells out each year. The lineup typically features Yonder Mountain String Band, Leftover Salmon, Greensky Bluegrass, Railroad Earth, as well as additional interchangeable artists and special guests to throughout the years. The event also features specialized artist-led workshops and activities, an autograph singing, and off-site excursions, creating close connections in an intimate setting. The Avett Brothers At The Beach is bringing fans together for a 4-night concert vacation in Mexico! With the Caribbean Sea as a backdrop, guests will be treated to three shows from The Avett Brothers, plus music from Band of Horses, Brandi Carlile, Jason Isbell, Lake Street Dive, and The Devil Makes Three.